Private Instruction is a great way to target specific areas of weakness. Privates can be conducted on individual basis (1 on 1) or in a small groups. Private lessons may be conducted at New England Sports Center of Marlborough MA during public skating, on mini rinks, or large sheets of ice. 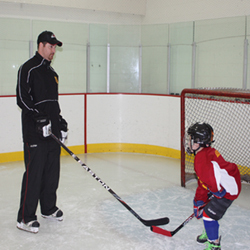 Our instructors are also willing to conduct private lessons at other venues in Massachusetts for a small fee. Take the first step to improving your player’s individual skill set by contacting to book your sessions today. Contact our coaches directly for availability!